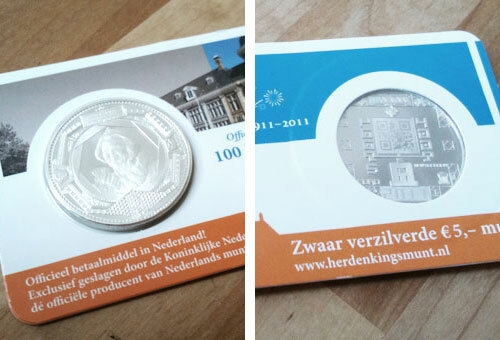 This morning I finally took delivery of the 2011 Five Euro coin from the Koninklijke Nederlandse Munt (Royal Dutch Mint). This coin has received plenty of coverage over the last few weeks due to the inclusion of a QR code in it's design - the first time we have seen the codes being used in such a permanent and far reaching way. Permanent in that these coins will be in circulation in the Netherlands long after many QR code campaign will have been and gone, far reaching in that they will pass through many hundreds of hands over their lifetime. That's all very interesting, but the big question for those of us who have been following the progress of QR code usage is, does it work? By that I don't just mean, "Does it scan? ", but "Does it lead somewhere with added value?". Does it give the user a reward for taking out their mobile phone, opening their scanning app (Optiscan for you iPhone users of course ;)) and capturing the QR code? Well, sort of. When scanned, you are prompted to watch a short video. An overclocked journey in through the front door of the Mint leading to a bin full of the new coins, with a soundtrack straight from a suspense thriller. Odd, but better than an overly long video. Most people scanning the code (in the long term) probably wouldn't be interested in the process of decision making and creation that led to the QR code use anyway (although a link to that on the page would be good). You can see the video by clicking the image to the right. Then we are presented with the site - a non-mobile site! A bad start, perpetrating the most complained about aspect of many QR code marketing campaigns. You would think that, if they were going to add a QR code to something as important and representational as their own currency, the homework would have been done on how best to implement it. This can of course be rectified, and hopefully will, but will it have already put too many people off? Once zoomed in, we can at least still play the game they have embedded here as it is not Flash based. 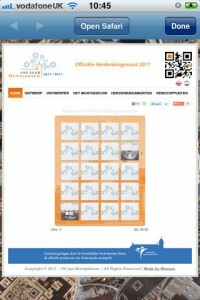 It's a simple game of memory, matching pairs of cards - all front or rear designs of commemorative Dutch coins. A nice enough distraction for a few minutes, but again, there is no further incentive. Where is my option to post my score online and share the link with friends? Maybe winning games could open up more of the website or other, more marketable incentives? What do you think? It's good to see QR codes used in this way, but I hope that the Royal Dutch Mint are paying attention and make suitable alterations to the landing page. There is also scope for them to change the destination over time, allowing for the QR code to have more longevity as people scan it to see where they are taken next.